The X-prize Foundation showcases and rewards cutting-edge innovations in fields that have the potential to benefit humanity. 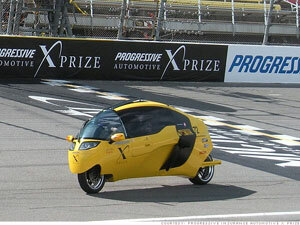 The Automotive X-prize is for fuel efficiency. Sponsored by the Progressive insurance company and partially funded by the Department of Energy, it was given in three different vehicle classes. Regardless of the class, the cars had to be safe, "commercially viable" -- meaning only that they had to perform more-or-less like a regular cars -- and they had to get at least 100 miles per gallon or the equivalent. Vehicles in this category seated two people side-by-side, as the name implies. They also had to go at least 100 miles before needing to refuel or recharge. The winner, in this case, drew on the advantage of electric motors: their much greater efficiency compared to internal combustion engines. Electric motors turn nearly all the energy fed into them into motion. Gasoline engines turn only about 30% of gasoline's energy into motion while most ends up wasted as heat. 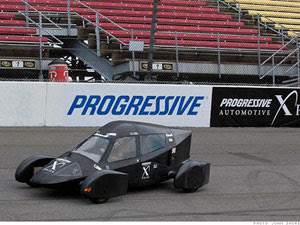 This car got 187 MPGe, or miles per gallon equivalent. 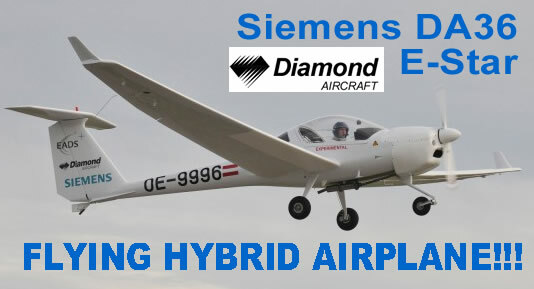 In other words, it can go 187 miles on same amount of energy as that contained in one gallon of gasoline. This Wave II also minimized one big disadvantage of electric drive: weight. Gasoline contains much more energy per cubic foot than batteries, so electric car batteries end up being big and heavy compared to a tank of gasoline. 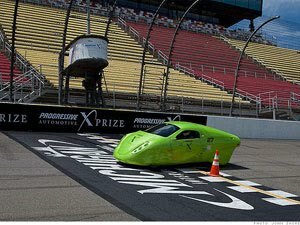 In this case, the car itself, built largely from aluminum, is so light that it all adds up to only 2,176 pounds total. That's less than a tiny Smart car. Cars in the "tandem class" were two-seaters with the occupants sitting one behind the other. In this case, you might question the use of the word "car" since this vehicle looks an awful lot like a motorcycle. It does have four wheels, though. It's just that two of them fold up and out of the way while driving, dropping down at low speeds to provide stability. It thus qualifies as a car under the X-prize rules. Its bike-style body saves a lot of weight, which confers advantages in both efficiency and performance. In tests, this car got to sixty miles per hour in a relatively blistering 6.6 seconds. Still, the Wave II takes almost 15 seconds to reach 60 miles an hour, good enough to win here but downright pokey by most standards. 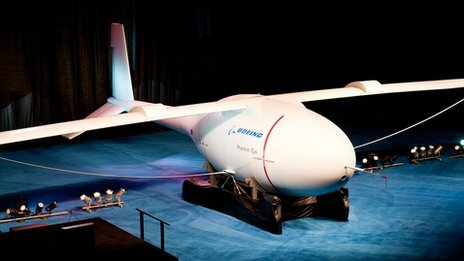 Hydrogen powered long term surveilance aircraft from Boeing ... 4 days in the air. God Bless America!!! 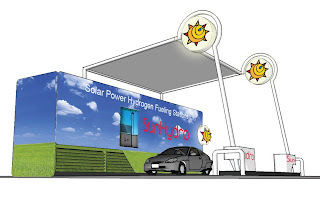 Hydrogen would command a key role in future renewable energy technologies, experts agree, if a relatively cheap, efficient and carbon-neutral means of producing it can be developed. 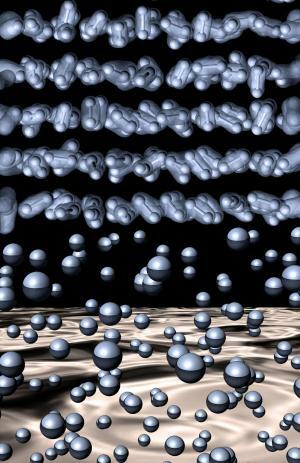 An important step towards this elusive goal has been taken by a team of researchers with the U.S. Department of Energy's (DOE) Lawrence Berkeley National Laboratory (Berkeley Lab) and the University of California, Berkeley. The team has discovered an inexpensive metal catalyst that can effectively generate hydrogen gas from water. Hydrogen gas, whether combusted or used in fuel cells to generate electricity, emits only water vapor as an exhaust product, which is why this nation would already be rolling towards a hydrogen economy if only there were hydrogen wells to tap. However, hydrogen gas does not occur naturally and has to be produced. 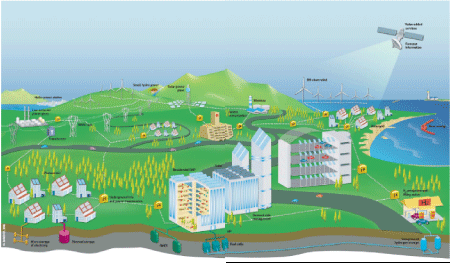 Most of the hydrogen gas in the United States today comes from natural gas, a fossil fuel. While inexpensive, this technique adds huge volumes of carbon emissions to the atmosphere. Hydrogen can also be produced through the electrolysis of water -- using electricity to split molecules of water into molecules of hydrogen and oxygen. This is an environmentally clean and sustainable method of production -- especially if the electricity is generated via a renewable technology such as solar or wind -- but requires a water-splitting catalyst.